Do you love Skyblocks? Do you hate having one block that takes you from minute 5 to year 5? Then this is the mod for you! Ex Nihilo Adscensio is the continuation of the Ex Nihilo mod from 1.7.10, rewritten from the ground up. The core concepts remain the same, but with a few key additions to give a little extra progression. Sieve blocks in the sieve for resources, just as before, but the sieve now takes different meshes. Each mesh gives potentially different results, so check carefully. 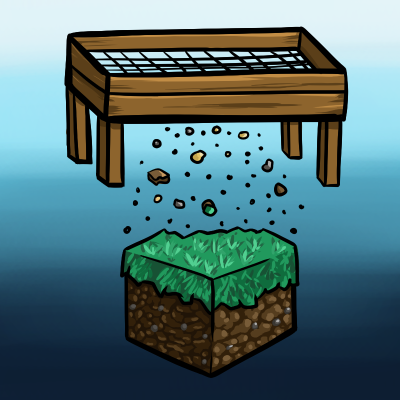 Sieve meshes can also be enchanted in a vanilla crafting table to give an extra boost to your efficiency (or fortune). Hammers now respect a mining level. No more using a wooden hammer for everything! Barrels are back! They can also potentially compost to something that isn't dirt, if you choose. The Broken/Crushed/Powdered Ore system has been replaced with a simple "Piece / Chunk" system. I felt like the old system served as nothing more than a nuisance, and ended up with something like this anyway. Most importantly, from a developers perspective, the entire backend is powered by JSON. This means almost everything is configurable, allowing you to set up the mod as you see fit. This means no more reliance on MineTweaker/ModTweaker. This mod has been through some alpha testing, and I believe it is now stable enough to be released to the general public. However, please note that I am sure there are uncaptured bugs that may or may not be world corruptors. Thanks to make this excellent mod! Do you think their will be a 1.12 verison of this mod? Any news on when a 1.11.2 update might be released? Or if one is in the works? Edit: 1.11.2 branch on Github. Thanks, I managed to compile a 1.11.2 version of this mod, so I'm good. do you mind giving me that version? i happen to be playing that version and am held back on that by many mods. https://github.com/MikeLydeamore/ExNihiloAdscensio/tree/1.11.2&nbsp; Download as zip, extract into a Forge src folder (you can Google Forge source). Compile it and then find the jar file in build/libs. That jar is placed in your mods folder. Worked like a charm for me. https://github.com/MikeLydeamore/ExNihiloAdscensio/archive/1.11.2.zip&nbsp; Click this link. It'll download that branch of the mod from Github. Then you Google how to compile a mod from Github and you should find a tutorial. Follow it, and you should be able to make it into a working mod. Definitely keep working on this. Would love to keep updating, yet not have to go for too long w/o this amazing skyblock mod. Works amazingly even in normal worlds for mass ore and string production. I miss my silkworm-infested giant tree already. Wait, I don't have any ore pieces in NEI, and the sifting recipes don't show any chances for getting ore. How do I get an ore chunk?